Make the most of your winter break by kick-starting your career. General Assembly is teaming with Colgate University to offer undergraduates the chance to gain entrepreneurial insight, business know-how, and technical skills with us this January at our flagship campus in New York City. What is the Business Accelerator program? Taught by industry professionals and covering top skills needed to be successful today, this one-week crash course will help you take an idea from concept to actionable plan. You'll get hands-on experience and practical lessons in product management, user experience design, web development, sales strategy, and digital marketing. By the end of the week, you'll have a better idea of the realities of the working world, and what it takes yo make your business idea a reality. 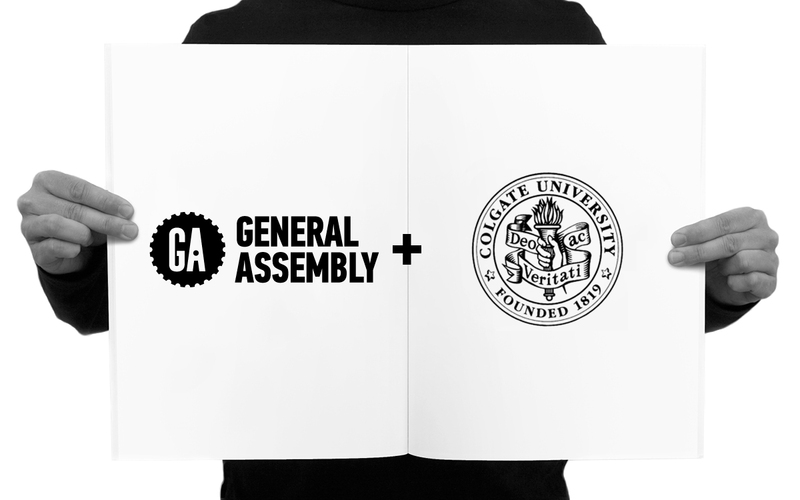 General Assembly is a global community of thinkers and makers that empowers people to pursue work they love by offering innovative educational programming on the most relevant skills in technology, business, and design. Where is this program happening? At General Assembly’s campus in NYC. January 5 - 9, 2015. The program is $2,000 per student. Full refunds will be given for cancellations before December 31, 2014. No refunds will be given after that time. Does this count for credit? No, this does not count toward college credit. Are you providing housing in NYC? We’re not providing housing at this time. Please email university@generalassemb.ly with questions, or enter your email above for more information and we'll reach out. 1. NO PURCHASE OR PAYMENT OF ANY MONEY IS NECESSARY TO ENTER. A PURCHASE WILL NOT IMPROVE THE CHANCES OF WINNING. VOID WHERE PROHIBITED. All federal, state and local laws apply. 3. By entering the prize promotion, all entrants will be deemed to accept these terms and conditions and agree that the decision of the Promoter is final and binding in all matters relating to the prize promotion. 4. All entry instructions will form part of these terms and conditions. Any breach of these terms and conditions will result in the forfeit of entry. Promoter reserves the right to disqualify and prosecute to the fullest extent permitted by law any participant or winner who, in a Promoter's reasonable suspicion, tampers with a Promoter site, the entry process, intentionally submits more than a single entry, violates these rules, or acts in an unsportsmanlike or disruptive manner. 5. To enter, please submit the online entry form available on https://generalassemb.ly/get/business-accelerator by 2015-01-09 23:55 UTC. 6. Upon entering, you will receive a unique URL to the sweepstake entry form. You will earn one additional entry per person who enters the sweepstake through the sweepstake entry form at your unique URL. 7. The start date for the prize promotion is 2014-11-13 10:03 UTC. The closing date for entry is 2015-01-09 23:55 UTC. The Promoter will not consider entries received after this date and time. The winner will be notified within 0 days of the closing date. The Promoter’s computer is the official time-keeping device for the promotion. Odds of winning the promotion depend on the number of eligible entries received during the Promotion Period. 9. There is no cash alternative in whole or in part for the prize. The prize is non-negotiable and non-transferable. Any difference between stated approximate retail value and actual value of Prize will not be awarded. All prize details not specified in the Official Rules will be determined in Sponsor’s sole and absolute discretion. 10. The prize is subject to availability. The Promoter reserves the right to (a) in the event of unforeseen circumstances, award an alternative prize of equal or greater value and (b) in exceptional circumstances, to vary, amend or withdraw this prize promotion on reasonable notice; provided Prize Provider is not responsible for providing any substitute prize except in its sole discretion. 11.Maximum number of entries allowed per individual is 20 (includes additional entries obtained through your unique referral URL). 12. The prize winner will be the first entry drawn at random. Promoter is not responsible for any delay or failure to receive notification for any reason, including inactive mail or email account(s), technical difficulties associated therewith, or winner's failure to adequately monitor any mail or email account. The winner must respond to Promoter within 3 days. Should the winner fail to respond to Promoter, Promoter reserves the right to disqualify that winner and select a new one in a second-chance random drawing, or to not award the prize at all. 13. The prize winner will be notified by email on or before 2015-01-09 23:55 UTC. 14. The prize winner may be required to take part in some promotional activity as a condition of receiving the prize, e.g. publicity photos. Winner may be required to sign an affidavit of eligibility, liability release and a publicity release. By entering or accepting any prize, winner allows Promoter to use the winner's name, photograph, likeness, voice, prize information, and biographical information for publicity and promotional purposes without further compensation where permitted by law. Except where prohibited, participation in the promotion constitutes participant's consent to Promoter’s use of participant's name, likeness, voice, opinions, biographical information, hometown and state for promotional purposes in any media without further payment or consideration. 15. Details of the prize winner (name and county only) may be obtained by written request by sending a self-addressed envelope to the Promoter at 10 East 21 Street, 4/F, New York, NY OR 9 Back Hill, 4/F, London EC1R 5DF after 2015-01-09 23:55 UTC. 16. PROMOTER MAKES NO REPRESENTATIONS OR WARRANTIES OF ANY KIND, EXPRESS OR IMPLIED, REGARDING ANY PRIZE OR YOUR PARTICIPATION IN THE PROMOTION. BY ENTERING THE PROMOTION OR RECEIPT OF ANY PRIZE, EACH ENTRANT AGREES TO RELEASE AND HOLD HARMLESS PROMOTER, PRIZE PROVIDER AND THEIR SUBSIDIARIES, AFFILIATES, SUPPLIERS, DISTRIBUTORS, ADVERTISING/PROMOTION AGENCIES, AND PRIZE SUPPLIERS, AND EACH OF THEIR RESPECTIVE PARENT COMPANIES AND EACH SUCH COMPANY'S OFFICERS, DIRECTORS, EMPLOYEES AND AGENTS (COLLECTIVELY, THE "RELEASED PARTIES") FROM AND AGAINST ANY CLAIM OR CAUSE OF ACTION, INCLUDING, BUT NOT LIMITED TO, PERSONAL INJURY, DEATH, OR DAMAGE TO OR LOSS OF PROPERTY, ARISING OUT OF PARTICIPATION IN THE PROMOTION OR RECEIPT OR USE OR MISUSE OF ANY PRIZE OR ANY TRAVEL RELATED THERETO. THE RELEASED PARTIES ARE NOT RESPONSIBLE FOR: (1) ANY INCORRECT OR INACCURATE INFORMATION, WHETHER CAUSED BY ENTRANTS, PRINTING ERRORS OR BY ANY OF THE EQUIPMENT OR PROGRAMMING ASSOCIATED WITH OR UTILIZED IN THE PROMOTION; (2) TECHNICAL FAILURES OF ANY KIND, INCLUDING, BUT NOT LIMITED TO MALFUNCTIONS, INTERRUPTIONS, OR DISCONNECTIONS IN PHONE LINES OR NETWORK HARDWARE OR SOFTWARE; (3) UNAUTHORIZED HUMAN INTERVENTION IN ANY PART OF THE ENTRY PROCESS OR THE PROMOTION; (4) TECHNICAL OR HUMAN ERROR WHICH MAY OCCUR IN THE ADMINISTRATION OF THE PROMOTION OR THE PROCESSING OF ENTRIES; OR (5) ANY INJURY OR DAMAGE TO PERSONS OR PROPERTY WHICH MAY BE CAUSED, DIRECTLY OR INDIRECTLY, IN WHOLE OR IN PART, FROM ENTRANT’S PARTICIPATION IN THE PROMOTION OR RECEIPT OR USE OR MISUSE OF ANY PRIZE OR ANY TRAVEL RELATED THERETO. If for any reason an entrant's entry is confirmed to have been erroneously deleted, lost, or otherwise destroyed or corrupted, entrant’s sole remedy is another entry in the promotion, provided that if it is not possible to award another entry due to discontinuance of the promotion, or any part of it, for any reason, Promoter, at its discretion, may elect to hold a random drawing from among all eligible entries received up to the date of discontinuance for any or all of the prizes offered herein. No more than the stated number of prizes will be awarded. In event that production, technical, programming or any other reasons cause more than stated number of prizes as set forth in these Terms to be available and/or claimed Promoter reserve the right to award only the stated number of prizes by a random drawing among all legitimate, unawarded, eligible prize claims. The Promoter accepts no responsibility for any loss, damage, injury or disappointment suffered by an entrant resulting from entering this prize promotion or by the entrant's acceptance of the prize. In the UK, notwithstanding the foregoing, nothing shall exclude the Promoter's liability for death or personal injury resulting from its negligence, or for fraud. The Promoter is General Assembly Space, Inc., a company registered in USA. Any queries and comments should be directed in writing to the Regional Director of General Assembly Space, Inc. at 10 East 21 Street, 4/F, New York, NY.